With Tizen OS Samsung want to stand a competitor for Android OS, but for now its Tizen OS far away even from the Older Android Versions. Although after a decent sell of Samsung Z1 they launched Entry Level Samsung Z3 with specs like Spreadtrum 1.3 GHz Quad-core processor, 5.0 inches display, 8 and 5 MP Camera, 8 GB ROM with 128 GB Ext SD support, 1 GB RAM and 2700 mAh Battery. Here we will have Short review, Pros and Cons of Samsung Z3. 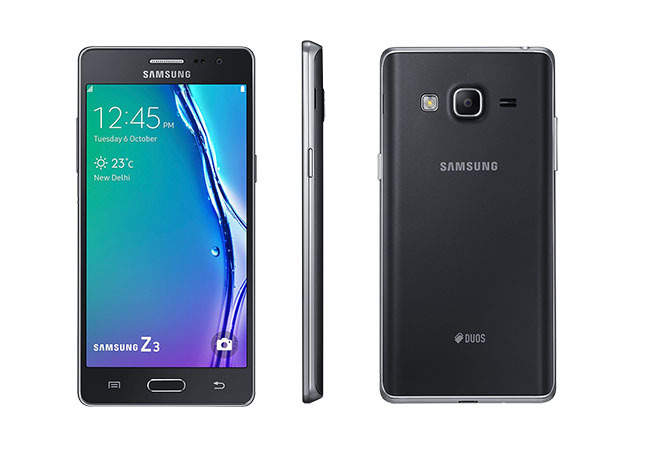 When we go through the look Samsung has retained their conventional design somewhat like Samsung Galaxy Grand Prime. Body is plastic build with dazzling metal finish including the silver rim at the sides. Device is firm and do not feels slippery in hand. The volume buttons are on the left, power button on the right, microUSB 2.0 port is at the bottom of the device and the headphone jack is at the top. 5.0 inches Super AMOLED capacitive touchscreen with 720 x 1280p resolutions and 294ppi display density is best part of handset which gives sharp and deep detail information about the pictures running on the device; this is really impressive in a budget segment Smartphone. We really appreciate this phone if they provide special protection to the device such as Gorilla Glass. Samsung claims that the Tizen is much optimized, light and Fast OS so in such optimized OS Spreadtrum 1.3 GHz Quad-core processor coupled with 1GB of the RAM is sufficient to make it run smoothly. The performance of this handset is pretty well. Although there is shortage of apps for the Tizen OS. Some of the popular apps are preloaded in this mobile such as Whatsapp, Facebook, Truecaller. The user interface looks a lot like Samsung Android TouchWiz. Camera quality is one of the mostly concern feature by the customer before buying a mobile phone, this handset has 8MP rear camera which has more pixels than its previous version but when we go through its quality we are disappointed that it takes time to focus, the camera sensor are not able to capture accurate colour although 5MP front camera with 120-degree wide selfie mode is relatively better. Before going too negative about its camera we also should be concern about this fact that it is entry level phone. The battery is another thing that go towards its pros side, 2700 mAh battery in Tizen OS perform obviously better than Android. Switching the screen to a battery saving monochrome mode to give you extended standby time. Super AMOLED crystal clear display. Easily can play Full HD videos. The phone gives Smooth performance. The memory can be extendable up to 128GB. Features like Ultra Data Saving Mode & Ultra Power Saving Mode helpful to save Internet data and Battery juice. Auto brightness option is not available. Rear camera is not able to take quality pictures as expected from 8MP camera. Users have very less apps to choose from. Does not have any special Glass protection. Sample unit doesn’t support OTG Cable. WhatsApp does not support voice call function. First thing i just want say about this phone is "don’t even think to buy" it if you are multiple App user, Gameholic and always try new apps; because this handset is just like older version of Android, even Gingerbread 2.3.x was better. Although the Tizen team continuously trying to improve it from all the ways. But if you want a phone from which you can only use some popular apps, which is quite smooth performing have good battery backup than you can go with this device.